Climate changes have made scientists speculate about the possible future shift in range of many species, but in the ocean waters off the southern coast of New England, one major ocean species isn't waiting for further changes -- it's already packed up and headed north, primarily for Canada. Lobster fishermen across southern regions of Connecticut and New York hauled in their traps this month in accordance with the second annual fall closure of their fisheries, as state officials strive to sustain what little is left of their prized crustacean populations. According to Connecticut's Department of Energy and Environmental Protection, the amount of lobster caught fell from 3.7 million pounds in 1998 to 120,000 pounds in 2013, including a 100,000-pound drop since 2012. In 1998 and 1999, lobsters reached a peak population at 20 percent of the department research trawler's catch rate, but last year they didn't even represent 1 percent of that catch. "Recruitment numbers are simply failing," said Mark Alexander, supervising fisheries biologist at DEEP. "This means almost no new lobsters are entering the population or surviving long enough to, whatever the reason." 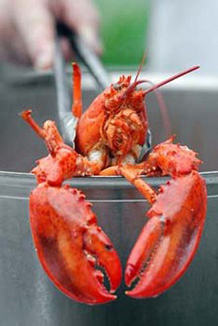 But a few hundred miles north, the story is much different, as lobstermen off the shores of Maine and eastern Canada have almost doubled production levels (ClimateWire, July 10). "Our largest LFA, or lobster fishing areas, the Canadian Maine Gulf and Bay of Fundy, have been persistently climbing over the last 10 to 15 years," said Michael Tremblay, a biologist focused on crustaceans at the Bedford Institute of Oceanography in Halifax, Nova Scotia. "Both in terms of number of landings, the catch rate recorded by fishermen and trawling records." Though northern counterparts are doing better and taking advantage of the situation, it will almost certainly be a short-lived succession, as Atlantic temperatures have been rising and are predicted to rise further, possibly pushing lobster populations still farther north. Michael Tlusty of the New England Marine Aquarium said that just as the current trend in lobster range has changed in the last few decades, it is likely to continue in the same progression, but with added burdens posed by climate changes. "Climate change is especially scary for lobsters," he said. "Because they rely so heavily on their external environment, you often get much larger responses to different environmental changes coupled together than when apart." A New England lobster pot. Photo courtesy of Flickr. Humans may not be able to do much to change the future of lobsters because of the combination of stressors facing them, including projected changes in ocean acidity, pollution and shifts in dissolved oxygen rates, according to scientists. "Ultimately, there may be very little we can do, if the environment is not on our side, almost nothing," Alexander said. Though some have called the lobster population shift a migration, Tremblay points out it is more of a change in conditions. "The southern northeast has been dealing with parasites and increase in predators, plus decreases in top predators, like cod." But Tlusty said there has also been a similar decline of top predators in other waters. The lower survival rates for lobsters are more likely due to the coupled impact of the many things changing in the environment at once, he said. Tlusty studies juvenile lobsters roughly 1 year of age under different stressors like temperature and nutrition changes. Small lobsters exposed to temperature differences from the offset, or lower oxygen levels, do all right, he said, but when these factors are coupled, mortality rates rise. "It's no doubt that this raised temperature compromises most other aspects of lobster functioning," Alexander said. "It makes them more susceptible and has allowed a lot of the other factors like parasites to come so heavily into play." Lobster populations reached their peak in southern waters in the mid-1990s but drastically fell after an amoebic parasite infection in 1999. Recovery from this drop-off was exacerbated by the fact that lobsters like it between 61 and 64 degrees Fahrenheit, while some shallow regions of places like Long Island Sound have surpassed 75 F.
It's not such a mystery why they have begun to change range, Tlusty explained, in light of all this. Tlusty said that to understand how lobsters live out their lives is to look at things through lobster eyes. This, he explains, means life is generally much slower but things are still constantly coming at you. "Crawling along the bottom of the ocean, bacteria are constantly raining down on them, so they evolved shells to defend themselves, but it takes a long time to construct and requires constant regrowth," he said. Tlusty said lobsters must still constantly fend off organisms that all very much want to eat the rich nutrients their shell is built from. During molting or times of stress, bacteria are often given a ray of hope, especially now as chemical changes in the water like acidification make it harder to grow shells. "A tiny break in the shell, a poor diet or stress during shell regrowth all present chances for bacteria to strike," he said. "Once this happens, the lobster is essentially defenseless." Lobsters shed their shells annually and most don't reach maturity until the age of 7, so they are exposed to many chances of mortality even after their first few years of life. "Most people would be surprised, I think, to know that the lobster on their plate is 7 years or older," Tlusty said. "This makes it hard to compare lobster recovery time to other species that have been depleted, because it takes this same span for one generation to begin to rebuild an entire population." Tlusty said, though, that there were as many as 20 hatcheries introducing lobsters into these same waters at the turn of the century, but they were never proved to increase populations or catch rates. Efforts are underway in some parts of New Brunswick, but often with little result. "Restocking efforts are mostly done to little effect, regardless of where you are," Alexander said. "How can you try to effect a whole cycle of change in one or two seasons?" Another thing threatening lobster fishing in both regions is the industry itself. Higher catch rates have yielded more intensive fishing in the north, while the decline in other species once heavily fished in both regions has made fishermen more dependent on the lobster catch. Meanwhile, officials are reluctant to impose all-out bans. "At first, a moratorium was suggested," Alexander said. "But that would have outright killed the lobster industry, so we settled for 10 percent reductions, in our case here in Connecticut and in New York choosing voluntary closures." But he concedes this has done almost nothing to help improve the crustacean's southerly populations. "Fishermen that once had their lobster license in the back pocket, in case all else failed, are now out there trying to make do with what's left, and in the north they're expanding things," Tlusty said. "We've never really put all our eggs in the lobster basket like this before, which makes it so painful as the industries are ripped away in the south, even though we saw this coming," he said. "People will continue to try." According to Commercial Fisheries News notes provided by DEEP, fishermen are working much harder with far fewer results, trying to hold onto their failing industry. In 2011 lobster dealers called the western Connecticut lobster fishing industry "dead," citing a case of a lobsterman hauling 200 traps and obtaining one lobster in the process. New York dealers had similar things to say in June 2012, when one dealer said he felt many fishermen were "ready to call it a day" and a fishermen noted, "The fat lady had already sung." "All we can do is go forward," Alexander said. "We'll do another catch assessment this year and make proposals for the future, but it's hard to imagine things really moving towards any other than additional restrictive measures." What may be the oddest thing left to struggle with as lobsters disappear from our waters, Tlusty said, is the knowledge that these silent creatures living at the depths of our oceans may come and go without us ever really knowing most of their secrets. "We're finally coming around to seeing their importance," he said. "It is going to take a lot of work to try and reverse changes already in play."